We provide an exclusive array of Laser Therapy Equipment is widely used in various hospitals, diagnostic centres, treatment centres etc. These are used for skeleton and health disorders, these are acclaimed for their significant features such as finest performance, strong, easy to operate, less power consumption and sturdy constructions. We fabricate the equipment using supreme quality materials based on latest innovative technology in complying with the quality standards. These equipment clients can avail from us at most reasonable prices. 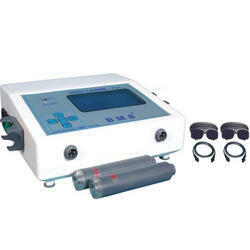 We are leading manufacturers of Laser Therapy Machine. we have produce the beam upto the frequency of 10khz for patient safety. probe tips are covered by ceiling to avoid wounds to the patients. 100 preprogrammed condition wise . we have pulsed mode 10 % 20% 30% 40% 50% upto 100%. for further clarifications click here https://youtu.be/8lUXm92u9gA. Owing to our expertise in this domain, we have been able to cater to the variegated requirements of the customers by bringing forth a wide array of Low-Level Laser Therapy Equipment. Our offered products are developed and designed at our in-house manufacturing unit with the aid of sophisticated machinery and technology. Further, this range is developed in adherence with the industry set guidelines. We are the leading manufacturers of Red Probe Laser Therapy Equipment. 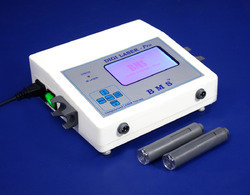 We are leading manufacturers of Laser Therapy Equipment. 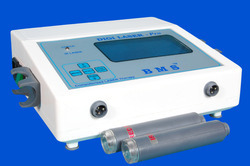 The Laser Therapy Equipment is advanced and superior therapy than another electrotherapy. The LLT is producing monochromatic cog rant beam “speckles” of high power density which can cause local heating off inhomogeneous tissues. Low-Level Laser Therapy works on the principle of inducing a biological response through energy transfer in that the photonic energy delivered into the tissue by the laser modulates the biological processes within the tissue. So, it also called photobiomodulation. 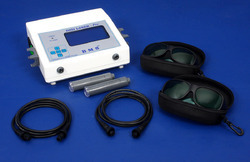 Looking for LASER Therapy Equipment ?